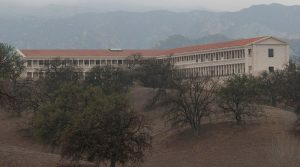 LOS ANGELES — On Saturday, April 21, the Hollywood Section of SMPTE®, the organization whose standards work has supported a century of advances in entertainment technology, will be guests of the Packard Humanities Institute and the UCLA Film and Television Archive for tours of the organizations’ PHI Stoa in Santa Clarita, California. Opened in 2016, the PFI Stoa is the second largest audio-visual archive in the United States and houses the archival activities of both the Packard Humanities Institute and the UCLA Film and Television Archive. Its facilities include 120 vaults designed for storing nitrate film, and a larger set of vaults for safety films and other items, all strictly controlled for temperature and humidity. The Stoa is also an architectural gem. The exterior has the form an ancient Greek stoa, with covered porticos. The interior is modeled closely on the 15th century Convent of San Marco in Florence. The stoa is not intended for public events, but rather is meant to serve as a quiet place where archivists and scholars work on preserving and studying films. The PHI Stoa is the West Coast complement to the Packard Campus of the Library of Congress in Culpeper, Virginia. Tours of the facility, available to SMPTE Hollywood members and others, will be offered at 10:00am, 11:00am, 12:00pm and 1:00pm. Individual reservations are required. Space is strictly limited. A light lunch will be served. Register: Space for each tour time is strictly limited. Individual reservations are mandatory. The Hollywood Section of SMPTE® was originally organized as the West Coast Section in 1928. Today, as its own SMPTE Region, it encompasses more than 1,200 SMPTE Members with a common interest in motion-imaging technology in the Greater Los Angeles area. The Hollywood Section offers free meetings monthly that are open to SMPTE Members and non-members alike. Information about meetings is posted on the Section website at www.smpte.org/hollywood. For more than a century, the people of SMPTE (pronounced “simp-tee”) have sorted out the details of many significant advances in media and entertainment technology, from the introduction of “talkies” and color television to HD and UHD (4K, 8K) TV. Since its founding in 1916, SMPTE has received an Oscar® and multiple Emmy® Awards for its work in advancing moving-imagery engineering across the industry. SMPTE has developed thousands of standards, recommended practices, and engineering guidelines, more than 800 of which are currently in force today. SMPTE Time Code™ and the ubiquitous SMPTE Color Bars™ are just two examples of SMPTE’s notable work. As it enters its second century, SMPTE is shaping the next generation of standards and providing education for the industry to ensure interoperability as the industry evolves further into IT- and IP-based workflows. SMPTE’s global membership today includes more than 7,000 members: motion-imaging executives, creatives, technologists, researchers, and students who volunteer their time and expertise to SMPTE’s standards development and educational initiatives. A partnership with the Hollywood Professional Association (HPA) connects SMPTE and its membership with the businesses and individuals who support the creation and finishing of media content. Information on joining SMPTE is available at www.smpte.org/join.